"A major stumbling block to adoption of evidence-based practice in the real world of clinical practice has been the absence of clinician-friendly guides. Such guides need to be understandable, free of technical research jargon, infused with clinical expertise, and rich with real-life examples. Rubin and Springer have hit a home run with this series, which has all of these characteristics and more." "Rubin and Springer have assembled the wisdom of leading practitioners of evidence-based practice interventions, enhancing the likelihood that these practices will be adopted by helping professionals. Written in the language of practitioners, this book represents an exemplar for dissemination of evidence-based practice information." 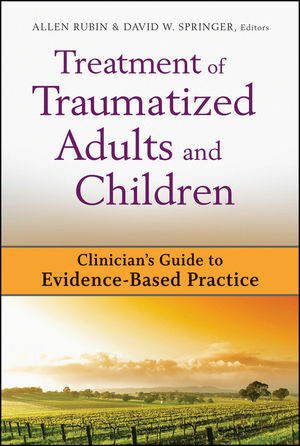 Part of the Clinician's Guide to Evidence-Based Practice Series, Treatment of Traumatized Adults and Children provides busy mental health practitioners with detailed, step-by-step guidance for implementing clinical interventions that are supported by the latest scientific evidence. Easy-to-use and accessible in tone, this indispensable resource is for practitioners who would like to implement evidence-based, compassionate, and effective interventions in their care of traumatized clients. Allen Rubin, Ph.D. is the Kantambu Latting College Professorship for Leadership and Change at the University of Houston Graduate College of Social Work. He is the author of a number of best-selling titles in social work research and he currently serves as Chair of the Evidence-Based Practice track for the Council on Social Work Education. David Springer is the Associate Dean for Academic Affairs and a University Distinguished Teaching Professor in the School of Social Work at The University of Texas at Austin, where he is also Investigator of the Inter-American Institute for Youth Justice and holds a joint appointment with the Department of Psychology.